We recently sat down with Asaf Goren the “Hebrew Breaker”. Asaf auditioned for “So you think you can Dance” and his video on YouTube has gone viral. In his video he uses a Tallis and a Shofar both have produced much controversy as well as praise as critics called his audition “Sacrilegious” while others praised his art and creativity and exceptional performance. You can see his video here followed by excerpts from our interview with him. Apparently nothing can come out of Israel without controversy. We are happy Jews finally have something from Israel to debate that doesn’t involve Arabs. We start every interview with the same question. What does being Jewish mean to you? How old are you? How long have you been dancing? I am twenty three years old and I have been dancing for eleven years. I started doing Judo for fifteen years. I was the five time Israeli Judo Champion. I was in Wingate Institute it’s a sport institute. My mom is a dancing teacher and choreographer, and she was always doing it in my living room, so I grew up with it. One day I was training in Petach Tikvah. I needed a drink of water so I went downstairs and I saw some kid’s break dancing and I was enthralled. I started going for more and more water breaks to watch them, and then slowly started joining them. How did you get to So you think you can dance? Well actually I tried out for many shows, and have been auditioning and trying out for years. I have been dancing in different contests throughout the world, and I am in the U.S. for six months already. I have won many different dance competitions. I am hustling, I know what I want, and I am chasing my dream. I am trying to use all my gifts and talents, I am not just a dancer, I also am a motivational speaker. I was traveling the world judging breakdancing competitions, as well as volunteering for youth programs and giving self-help speeches for teens. I developed a concept of healing through dance. I also sing and my dream is to heal through singing and dancing. What do you say to motivate teens? What message do you want to pass on to them? Anything is possible, if I can do it anyone can do it. I developed a lecture (I don’t know if it interprets well in English) called the “dream luggage” focused on At –Risk teens. Some of the teens were cutters, had drug problems, or dealing with depression, and obesity. What do you say to teens if they ask” It’s easy for you to be motivated, you are talented, good looking, and have many friends, how do you identify with an obese depressed teenager? I used to be the victim as well, I was bullied in school, I wasn’t always this confident. My dad left me when I was four, we have a good connection now, but growing up I was severely depressed. When I was nine, I thought I was not good enough, and was constantly being bullied. I was nine and did not want to wake up in the morning or go to school. I pulled through using my friends as support. I traveled the world by the age of fifteen. I taught myself English and Arabic. Since then I have had countless obstacles to overcome. I was in the army and after a year and a half I broke both my legs and had to have four surgeries. My entire life could have been ruined. I had metal pins put in, and I was again severely depressed as my career looked like it could be over. I struggled for a year and was dismissed from the Army due to my injury, and I still overcame it all and now I sing and dance and share my inspiration around the world. I was making money at fifteen by dancing and performing at Bar Mitzvahs, I used this money to travel the world. If I can do it anyone can. I am half Polish and half Yemenite and full Israeli. My father is Yemenite and my mother Polish, they met in Israel, I am very close to my mother. My mom raised me on her own. I started break dancing and traveling the world very young. My mom comes from a traditional contemporary dance style, and she pushed me to dance more creatively. I needed to find my own style, and wanted to use my own culture and use my own background. What kind of style dance do you dance? It is a combination of break dance, Yemenite dance, traditional Hebrew dance and a very ancient form of movement. It also combines a special Israeli ingredient called Chutzpah. The form of movement I use is based on the Hebrew Alphabet, you can see this Aleph, this is Beit (showing different dance moves) I was very close to a traditional dance movement and special self-defense movement called Abir. The story goes that King David when he was trying to bring his wife Queen of Sheba from Yemen, he sent a fighting force to protect her, this fighting force eventually stayed there as well as the Queen converted all her people. As a result the Yemenite Jews have traditions that are passed down directly from King David for thousands of years, and one of those things passed down is this ancient fighting style called Abir and it combines self-defense, Hebrew Alphabet, spirituality, and movement. My dance moves has a lot of these ancient movements in it. The leader of this movement is called Aluph Abir and he has a school in Israel and he teaches self-defense combined with Torah. How has your life changed since the video? Well I am getting lots of interests and messages and I finally feel like my career is taking off. I am getting lots of kind words and support, and glad to expose the rest of the world to our culture. My life hasn’t really changed that much, this is just another step towards my goal, which is to bring a camel to Hollywood Boulevard. My goal is to shoot a music video with my song, on a camel, and parade it down Hollywood Boulevard. My song is called Prince of Heart, that you can be a Prince without a dollar in your pocket. You seem very humble the exact opposite of how you come off in the audition a little bit cocky. Humility comes from being sure of yourself and knowing who you are and feeling confident that you have something to offer. If you are confident in your skills there is no reason to show off or act like a big shot, but when I dance I am cocky because that’s part of my act the chutzpah is an integral part of the style. Did you get any bad feedback about the audition? I got a lot of bad feedback. They criticized me for throwing the Tallis on the floor. That it’s a holy object, but there is nothing inherently holy about it, and I don’t think I did anything wrong. I must confess though, that in front of a big audience and on live Television, I was scared and sweaty. There is many parts of the audition before and after that nobody sees, and they were talking to me a lot before about me, my family, and my goals. They were talking about my mom, I was so emotional. They made me cry. In the moment I wasn’t really thinking. I wasn’t deliberately trying to desecrate it, just the opposite I wanted to make the world see the beauty in our traditions. A lot of people see this negatively unfortunately. What was the worst thing people said? Oh it was bad. One guy was cursing me so badly I am embarrassed for him. I am trying not to take it personal, and I know you can’t have everyone love you, but some of the comments have shaken me to my core. The worst part is that the bad comments are coming from my own people. The non-Jews have written the most beautiful comments thanking me, and then my own people write some really mean hurtful stuff. Did you get many Anti-Semitic comments? Not on this video specifically but throughout my career I have been battling that and trying to ignore that for years. In Europe people have cursed me, spit on me, and even refused to go on stage with me. During the war in 2012 they blamed me for babies dying in Gaza. I even had one of my events cancelled. I was supposed to go to Morocco to compete in Red bull BC1. It is an International dance competition. Extremist threatened to bomb the place if there will be an Israeli in the competition, so Red bull couldn’t afford the security, or the controversy, and had to cancel my flight. They invited me to Eastern Europe instead, and I was the first Israeli to win this distinction. I was hustling for this I was pushing for it, sending mail and sending audition tapes and made sure I got noticed. Have any religious people complained? Not many, but some. Some were saying that I am not even religious I shouldn’t be representing them with the Tallis. Have you had many girls message you? How much is many? Over a thousand? Mostly Jewish? well maybe fifty, but I ignored all of them, I have a goal, I don’t have time for a social life. I am focused on my dream and I can’t lose focus right now by hanging out with girls. Not just Jewish girls but all types of girls said “I am cute etc” but I can’t respond to anyone. You come off a bit arrogant in the beginning of the audition and then you seem to win over the judges and audience, did you feel like people were judging you in the beginning? Not at all. There are parts of the audition before and after that are not on the video. They asked me about my family, my life, my background before I did the show. I was crying way before I even started the audition just from the questions they asked me, so when I started with the Shofar and the tzitzit it is taken a bit out of context as they already asked me all kinds of questions related to that. 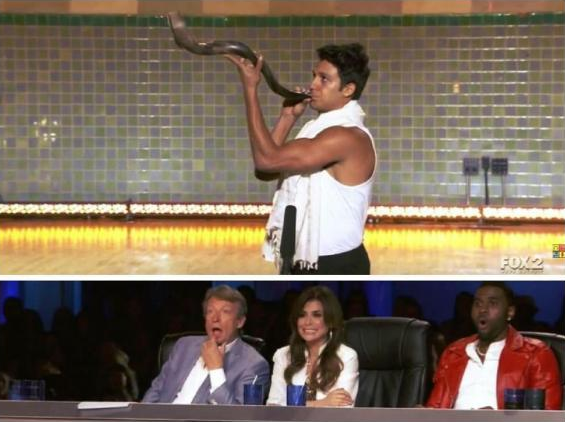 Paula Abdul was even trying to blow the Shofar and was really impressed with me. I was crying and excited so when I started dancing it wasn’t like I just walked on and was cocky. Where do you prefer to live; America or Israel? How do you compare Israeli girls to American girls? And Israeli girls, to American Jewish girls? HaHa, you know Israeli girls are tough. You know how it is they are just tough. American girls are friendlier. It could be they are just nicer to me because I am a foreigner, they hear my accent right away so they treat me differently. I am sure the opposite is true as well, Israeli girls are probably nicer to foreigners. What would you like to say about the entire experience? The most important mission I have is to spread my motivational classes and to help others by spreading love and spreading my culture. Dancing is just the way I use to achieve this goal of helping and motivating people. I am dancing my way into peoples hearts, so I can spread a message of love. What was you say to the critics and the haters? On one hand I can say keep hating and I don’t care, but they must understand, that if they want to complain they should talk to me face to face. Not just be keyboard warriors and write all these nasty comments. Let them talk to me face to face and see who I am before they make judgments. If they can represent better and have a better way to spread the message let them get up and do it. They should spread the message in the way they think is the right way, but as long as they are not doing anything positive and not doing anything to further our culture, then they should avoid being so negative.